This Lampe Berger has the form of a boat or that of an ancient oil lamp and has a nice masculine appeal. 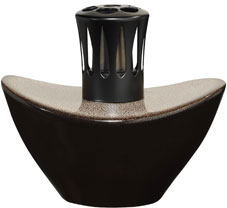 The lamp has a pebbled brown on gray on the top surface and a very dark brown base. It is impeccably finished and detailed through the use of a Japanese glazing technique called 'Temoku' that upon firing produces a fusion of lighter and darker tones. It is supplied in a gift box with an Air Pur burner, funnel and instructions.